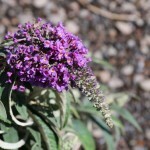 A non-invasive, low spreading shrub with feathery dark green leaves. It will bloom continuously from early summer to frost with spires of dark purple flowers. It will attract butterflies and hummingbirds. It grows best in full sun and a well-drained soil. Prune to encourage new growth and keep the plant tidy. A useful addition to the shrub border, butterfly garden and wherever a small shrub is needed. PP 24,514.